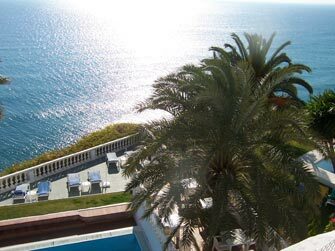 The Hotel Paraiso del Mar combines a breathtaking view of the Costa Del Sol with a cosy atmosphere, that makes you feel as if you were in your own mansion. The hotel owner, which converted a beautiful villa into a magnificent hotel, is at the hotel on a daily basis making sure that all of your wishes are fulfilled to the utmost detail. All rooms are equipped with luxurious Jacuzzis and have a marvelous view to either the beach or our tropical garden. Sit back and relax on your own private rooftop terrace or on one of the many discretely located spots available throughout the hotel facilities. The ones, who prefer long walks on the beach, will appreciate the direct access to the Playa Burriana. In the evening, experience genuine mediterranean lifestyle in the old town of Nerja, which is just a 10 minute walk away. To get you into the holiday mood, we invite you to take a virtual tour or browse through the beautiful photos of our rooms and hotel facilities. Make a reservation request online or call us at +34-95-252-1621, we will be happy to answer your inquiries. In the meantime, we wish you a pleasant online experience and look forward to welcome you at the Hotel Paraiso del Mar!